Dr. Peter Frankopan is a historian and Senior Research Fellow at Oxford University whose writing has featured in The New York Times, The Financial Times and The Guardian. 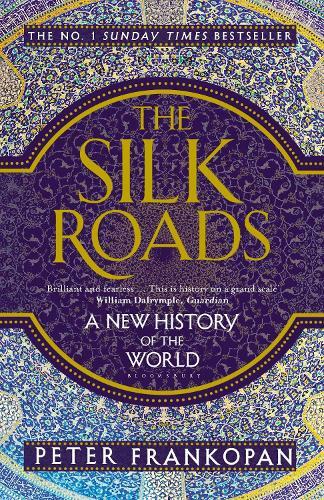 His internationally bestselling The Silk Roads, which was our Waterstones Non-fiction book of the Month in June, charts the history and resurgence of that once glorious transportation network. The challenging and dazzling work rewrites history from an Eastern perspective and argues why we need to rethink our Western bias. Everyone loves history. Books about the past are immensely popular – as are TV programmes that attract huge audiences whether they are factual, like the terrific recent series on Rome by Mary Beard or Susannah Lipscomb and Dan Jones’ outstanding Henry VIII and his Six Wives, or fictionalised versions of the past like the multi-award winning Wolf Hall or Downton Abbey. But walk into any bookshop, or settle down in front of the TV one evening for some period drama, and by and large you are faced with familiar fayre: the Tudors are everywhere, as are the First and Second World Wars. The Victorian era and the Battle of Waterloo get plenty of coverage on the shelves and the airwaves too. We like topics we already know something about – usually topics that we studied at school. Of course that means that the tail wags the dog: books and programmes about things that are already popular do well, precisely because there is already demand for them. It can also mean that our vision of the past reinforces itself and becomes stuck in its ways. And history that gets stuck in its ways doesn’t just become bad history; it becomes mythology. We are acutely aware that we live in a changing world. Terrorism, civil war and state failure in Syria and Iraq are problems that show no signs of abating. Low prices have put unprecedented strain on oil-producing countries, raising the chances of volatility and even possible regime change. Relations with Russia are problematic, to put it mildly, and not only because of intervention in Ukraine. Turkey, Pakistan and India are all at the cross-roads, with much resting on decisions being taken by their respective leaders. Then there is China whose gallop forwards over the last decade has been nothing short of astonishing. And yet these are countries, regions and peoples we know little about. We know little of the art, literature, music and history of Persia and Iran, and next to nothing about Russia except for a brief effervescence between 1890–1930. The Ottoman, Byzantine, Mongol and Safavid empires are a mystery apart from to the most committed non-specialist reader – while the same can be said for the great dynasties in China like the Tang, Song or Ming, whose names might be familiar, but whose policies, achievements and mishaps are not. There is a good reason for this: history, as they say, is written by the winners. And for the last four hundred years, the winners have been based in Europe – and above all in Western Europe. Ask yourself if you can name an Italian composer, French novelist, Spanish painter or German philosopher, and with any luck, you’ll be able to do so. As the same question about any country east of Turkey and most will struggle. Who is the best novelist writing in Arabic – or Mandarin – today? Or the most exciting Russian contemporary artist? Or the most popular musician in Iran, Pakistan or India? The relentless focus on our own, glorious past has meant we do not turn our attention to other parts of the world. At a time of change, telling the stories of other countries, peoples and places whose fortunes and misfortunes have a direct impact on our own is important. The challenges and opportunities of tomorrow are to be found along one of the most important and ambitious programme of economic development programmes in history. China calls it the One Road, One Belt initiative; we would call it the revival of the Silk Roads. These were networks and connections that once joined three continents together, linking Asia with Europe and Africa. Along them flowed silk, spices and ceramics, but also disease, genes and violence, ideas and faith. Traffic was not only east-west, as lazy assumptions make out, but fanned out in all directions – and over short, as well as long distance. The Silk Roads were the world’s central nervous system until the rise of the west; and they are becoming so again. In my book, I tell the story of the past from the vantage point of the veins and arteries that carried traders and warriors, merchants and explorers, pathogens and madmen. In doing so, a new past emerges, not only of the Silk Roads themselves, but of the way they shaped events across the world. I show how Greek culture and language influenced Buddhism two thousand years ago, how slaves were trafficked by Vikings in huge numbers to Muslim Baghdad in the early Middle Ages, how the construction of the Taj Mahal was linked to Columbus’s crossing of the Atlantic, and how the First and Second World Wars were closely tied to changing fortunes in the heart of Asia. The Silk Roads will change the way you think about the past and the present. And better still, it looks glorious. People say you shouldn’t judge a book by its cover. On this occasion, you can. This dazzling history is a refreshing and convincing antidote to all the Eurocentric accounts of the world and has a sweep and ambition that is rare. Underpinned by scholarly skill yet rich with jewels of anecdotes and insight, The Silk Roads is as enlightening as it as enthralling.